Last week, the US dollar gained against the yen and all the commodity currencies, but lost out to the pound and the resurgent euro. The big event last week was the release of the Federal Reserve policy meeting minutes for October, which hinted that tapering might happen as soon as December if the economy continued to improve. The release was followed by positiive job data, a signal to the markets that tapering could be on the way. Meanwhile, mutterings about a potential negative ECB deposit rate hit the euro in midweek, but it recovered after these rumours were dismissed by Mario Draghi. US Pending Home Sales: Monday, 15:00. After unexpectedly falling to 5.6% in September, the biggest drop for three years, contracts to purchase existing U.S. homes are expected to gain by 2.2% this time around. US Building Permits: Tuesday, 13:30. Privately-owned housing units in the US fell to a seasonally-adjusted annual rate of 918,000 in August, from 954,000 in July. This was, however, 11% higher than the figure for a year before. Single-family permits rose 3.0% to 627,000, and this suggests that construction activity will continue to increase through to the end of the year. The main downside risk for the US housing sector is the ongoing increase in mortgage rates. The rate is expected to rise to 940,000. US CB Consumer Confidence: Tuesday, 15:00 Consumer confidence in the US was down sharply in October, falling from 80.2 in September to 71.2, below expectations of 75.2. Optimism on current conditions also fell from 73.5 in September to 70.7 in October, and on the whole economists believe the Federal Reserve should continue with their bond purchasing until the economy fully recovers. A small rise to 72.2 is expected this time. UK GDP (second release): Wednesday, 9:30. The initial release showed that the UK economy grew by a strong 0.8% in the third quarter, and the second release should confirm this, marking the third consecutive quarter of growth. US Durable Goods Orders: Wednesday, 13:30. A surge in aircraft orders pushed this stat up to 3.7% in September, but excluding transportation the figure was down 0.1% suggesting that economic activity was slowing due to companies fear of the effects of tapering, and the effects of the government shutdown. Durable Goods Orders are expected to decline 1.5% overall, while non-transport Durable Goods Orders are expected to rise by 0.5%. 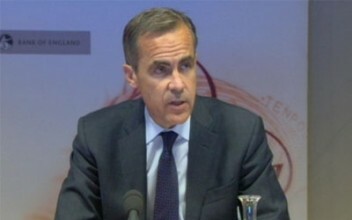 Mark Carney speaks: Thursday, 11:30. Mark Carney, head of the Bank of England, will talk about the Financial Stability Report, and is expected to touch on the job market improvement and measures to boost the UK economy. This could cause market volatility. US Unemployment Claims: Thursday, 13:30. The number of US citizens applying for unemployment benefits fell by 21,000 to a seasonally adjusted 323,000 last week, which suggests that the job market is rebounding. The four-week average was down for the third week in a row to 338,500, and both figures are similar to pre-recession levels. Analysts expect a further decline to 331,000. Canadian GDP: Friday, 13:30. The oil and gas industry helped the Canadian economy to grow by 0.3% in August, but despite recent rises analysts still expect growth to remain moderate in the months ahead. The Bank of Canada’s forecast for third-quarter growth was lowered from 3.8% annualized to 1.8%, but economists see the final reading as being closer to 2.5%. Modest growth of 0.1% is expected.